Experience 100% Long-Staple Cotton towels that are softer, more absorbent, and wash better than your average towel. Our luxurious towels provide a quick and classy update to any bathroom or spa décor. The 600 gram weight makes these towels soft, fluffy, and luxurious, yet gentle and practical. The generous 13" x 13" size makes these towels ideal for facial cleansing, cold or warm compresses, and household cleaning. And at a price that won't break the bank, these towels are the affordable touch of luxury you've been missing. The quality of towels is determined by the GSM (grams per square meter). The more grams per square meter means that the towels are more absorbent and longer lasting. 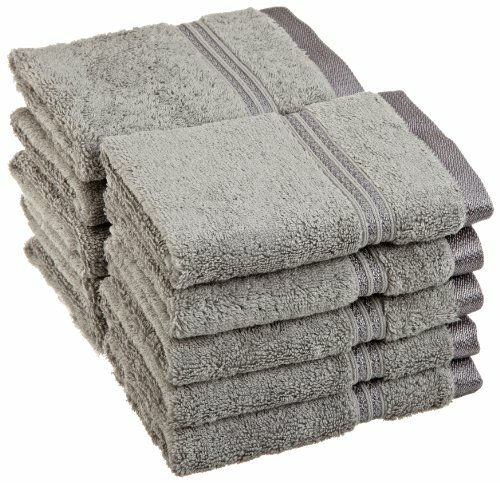 Coordinating 3 Piece Sets, 6 Piece Sets, Hand Towels, Bath Towels, Bath Sheets, and Bath Mats are available separately. "So very soft I love these towels!!" "Love these towels. They are luxurious and soft." "after you wash it, OMG heaven"
"These are the nicest towels I've ever owned. They're thick, soft, absorbent and the color...I love the color." "They are nice and big and thick and of very good quality. When it comes to my bath towels and wash cloths I only buy top quality and I would definitely purchase these face towels again and again." "These wash cloths are so thick and soft, I just love them. I would not hesitate to purchase this brand in the future."